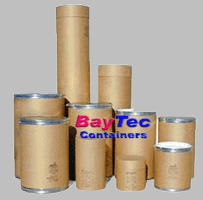 BayTec's range of Cardboard Shipping Barrels fulfills a large number of cardboard drum packaging requirements, in particular for the chemical, pharmaceutical, glue, paint and food industry. In addition to the standard Paper Cardboard Drum, BayTec sells specialty cardboard drums, including cheese drums, a feed storage, tapered barrel and a Harvest Pack for transport of tomato paste, purees and particular food products. Free Shipping is for 48 Lower States Only Cardboard drums have Superior stack strength for dry or solid products. All Cardboard drums and Cardboard Barrels Meets UN Standards. The Fiber Drums shown are a Cardboard type material with an Open Top Head. The Entire Top of the Barrel is removable with a Lever Lock Ring or Telescoping Tapered Lids that fits Over the Base part of the Drum. On the Open Top Lids these have an Easy-on, easy-off lever lock drum cover ring accepts tamper-evident seals. A Welded Metal Chime is on both ends of the drum ensures stability for your product. Fibre Barrels offer unusually low tare weight and considerable strength against impact. The Cardboard fiber interior provides thermal insulation and protects sensitive products and the full open top assures quick filling and dispensing. The Fiber Drums are available in a wide range of diameters, heights and capabilities and meet all applicable shipping requirements.